It's rare that we see a concept car make it to full production with minimal changes, but with the Lexus LC 500 - on the exterior at least - things are different. It's an almost carbon copy of the futuristic LF-LC Concept, and that means it looks absolutely fantastic. With prices starting at $92,200 (£75,595) the future certainly doesn't come cheap, but walking up to the LC 500 and sliding into the driving seat does soften the blow. That said, considering the price tag, the Lexus LC 500 is lacking in one area - in-car tech. While on the outside it still looks like a futuristic concept car, the infotainment feels like a bit of a blast from the past. However, with a naturally aspirated V8 under your right foot you won't need a heap of tech to keep you entertained. As is already probably clear, the Lexus LC 500 looks stunning. It's cutting edge design, powerful, low stance and sizeble 21-inch wheels ensures it's a head turner as it rolls down the street. The door handles are flush with body, and pop open like tiny wings when you unlock the car, allowing you to open up the large door. There's a cheekily hidden small spoiler too, which automatically deploys at speeds above 50mph, providing additional stability - although you'll find a button in the cockpit to open it at lower speeds if you wish. Under the hood we had a 5 liter, naturally aspirated V8, which means not turbo or supercharger and thus no lag in acceleration when you put your foot down, plus it makes a great sound. It's connected to a 10-speed automatic transmission which allows you to glide along with very little effort, however a manual gear select can be adopted using the paddle shifts located just behind the steering wheel. Lexus also offers the LC 500 as a hybrid, with a 3.5 liter V6 combined with an electric motor for more efficient and environmentally-friendly driving. The body of the LC 500 is a mix of carbon fiber and lightweight aluminium, keeping the weight of the vehicle down, with a core frame made from ultra-high tensile strength steel. While this sporty coupe may look like a two seater, it actually comes with two rear seats as well, although legroom is at a premium, so rear passengers are best kept to young children (ISOFIX points are included). The front seats are comfortable, and the cabin is spacious and as well as being heated, the front seats are also air cooled - which is a great feature during hot summers. It's one of the features I miss the most when going back to my car. There's a surprising amount of storage space in the trunk too, ensuring you can take the LC 500 on holiday with more than just an overnight bag to your name. The Lexus LC 500 isn't exactly lacking in tech, but the way its implemented now feels dated - especially when you consider its futuristic exterior. We're now accustomed to seeing touchscreens in our vehicles - and the fact there isn't one here is a little alien. The sizable 10.25-inch main display also feels like it's set back too far which, in part, is a subtle hint that you shouldn't be reaching your finger towards it, but I'll admit more than once I went to tap the screen before remembering it wouldn't work. Instead, there's a laptop-like touchpad located in front of the gear shift, which allows you to navigate around the interface, and you press the pad in to make a selection. At times I found it rather fiddly, and the arrow occasionally jumped around a little, making it difficult to get to a particular menu in an efficient manner. There are physical controls for climate and volume though, so they at least can be easily managed while driving, but the touchpad does not lend itself well to 'eyes on the road' control. However, once you get to where you need on the interface, the features are great. The satellite navigation imagery does look a little out of date when held against the like of Google Maps and Apple Maps on our smartphones, but it’s accurate and the traffic updates are on point. Navigation instructions are also relayed to the (optional) color HUD (heads up display) which is projected onto the windscreen in the eye-line of the driver - giving you key information without having to take your eyes off the road. The HUD also provides your current speed, direction of travel and lane detection notification. It's a useful addition and one I used frequently on every drive. You'll also find an 8-inch TFT display in lieu of an instrument cluster, which can display a range of information other than your speed and fuel level including trip details, mpg (miles per gallon) and more. The LC 500 comes packed with a range of sensors which can detect the current speed limit and offer adaptive cruise control, blind spot monitoring, automatic high beam lights when driving on unlit roads at night and sway warning. There's a rear camera which is engaged when reversing, making parking the wide-hipped LC 500 easier, as well as parking sensors all around the vehicle ensuring you don't hit any obstacles which may be hidden from your view. The Lexus LC 500 I was driving also had the optional extra of the 13-speaker Mark Levinson stereo installed and it sounds fantastic. Those who need access to power will find a couple of USB ports hidden beneath the center armrest, which are handy for topping up your phone on long drives. There's not a lack of tech then, but the LC 500 lacks the futuristic control we'd expect from a car with such bold exterior styling. 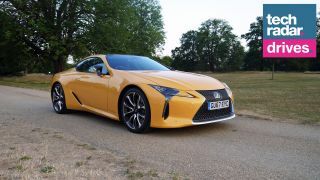 However, you do get superb, head-turning looks, a fantastic sounding and performing engine, comfortable ride and tech that works (once you've grappled with the controls), making the Lexus LC 500 a seriously cool coupe. John McCann is getting behind the wheel to give you an alternative look at the wealth of cars – and the tech inside them – available today. From super-fast sports cars to tech-packed hatchbacks, he'll take you through a range of makes, models, power and price tags in his regular TR Drives column.